Our gaming group is always on the lookout for good fillers, whether it be card games, social deduction games or whatever, a good filler is not only necessary to the mental health of any gaming group after playing a 3 hour brain burner, but very hard to find. If a good filler is hard to find, then a good filler wargame is nigh impossible. You might have better luck trying to find Sasquatch. Well, the search is over as I finally discovered (even though the game was originally released in 2011) a wargame that is quick and really easy to pick up. 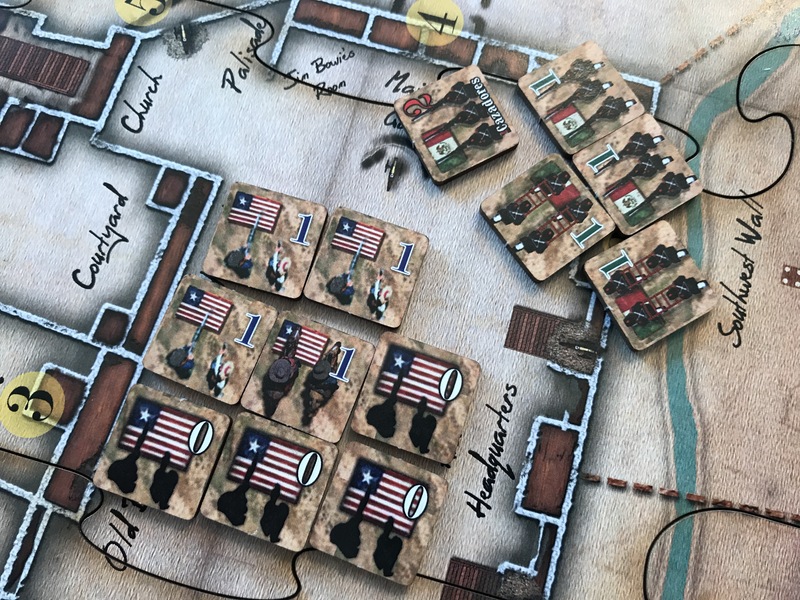 The Alamo Remembered 2nd Edition from Victory Point Games is such a quick filler game for 1-2 players that plays out the desperate last stand defense of the Alamo as the Texians, led by Davy Crockett, Jim Bowie and William Travis, hoped against hope to somehow defend the former mission from over 1,500 well trained and well armed Mexicans led by General Don Antonio Lopez de Santa Anna who was hell bent on destroying the uprising before it even could start. The Alamo Remembered is a redesign of The Alamo from Dana Lombardy’s original which can be found in the pages of Conflict magazine and the 2nd Edition version comes in the usual VPG red pizza box, but with an added surprise as the components are seriously upgraded from the magazine version with a full color rule book, an 8½” x 16½” mounted puzzle style game map and 54 double-sided 3/4” laser cut cardboard game pieces (you will need to wipe the counters down to remove the aromatic soot from the edges with the included Sir-Wipes-A-Lot napkin). I have always been impressed with VPGs counters. They know how to make them both attractive and most importantly functional. The counters are gorgeous and are cut from thick cardboard that will definitely wear well as you will be sure to play this game over and over and over again. The Alamo Remembered is designed as a very simple and fast playing game that will be sure to give you a nice themed experience that will be a serious challenge. The Texian (yes this is historically what they were called so don’t get up on my back about how you are Texans. You may be Texans now but in the 1830s you were Texians!) player will set up his units inside of the Alamo to defend six different sections of the wall that can be attacked. These sections have different breach values, which simply means that the Mexican player must have strength points among their surviving units at that wall equal to or greater than the printed value in order to successfully breach the wall and be able to attack the outnumbered Texians. When the defenders are placed by the Texian player, they are hidden from the Mexican player so they will have no idea about the strength of a certain defending stack. They can see the number of units in the stack and can deduce the approximate strength but this too can be deceiving as the Texian player has 10 “dummy” 0 value defenders that can be used to deceive. After the Texian player sets up, the Mexican player then places his forces and will attempt to outguess the Texians. This appears to be a simple game mechanically but really the placement is where the strategy lies and can really turn into a game of guess and guess again. After initial placement, the Texian player then gets to reveal their cannon in each stack and these cannon then get to fire at the approaching Mexican forces as the assault begins. The cannon simply remove one random counter from the Mexican stacks for each strength point they have so a stack with 2 cannon strength will remove 2 randomly chosen counters. This can be very tense and fun as you are drawing these counters with anticipation hoping to pull out the Mexican player’s better units. After the cannon fire phase, the Texian rifleman get their chance at glory as they then mop up the approaching Mexicans in the same manner. The surviving Mexicans in each stack, if they either meet or exceed the breach value, can then try and take out the Texian defenders. The problem is that the Texians have very limited numbers, including the previously mentioned dummy units which are used only to fool the Mexicans into firing at the wrong targets. Eventually and inevitably, the Texans are whittled down and the breach occurs leading to the Last Stand. The Last Stand takes place if the walls are breached during turns 1-3 or after turn 3 if no breach has occurred. This phase also has some random drawing as the Mexicans will add up their total strength values of the breaching units and then remove that number of Texian counters at random. In this way, many of the Texians dummy units will be removed which doesn’t affect the final score. The Mexicans must get a little lucky and draw the 1 value or hero units in order to minimize the final score for the Texians. I know that it seems as if the Texians have no hope, and that really is the case, but their hope lies in how stiff a resistance they put up and how long they hold out. The longer they hold out, the less VP the Mexican player will score. Remember that the Alamo was a Mexican victory and this game doesn’t attempt to fool you into believing you can change history. It is predetermined that the Mexicans will win! No fairy tales here. In the Last Stand phase, they have added some really neat and eclectic elements to the design. Jim Bowie may crawl out of his sick bed and get into the fray, if you flip his counter and it lands face up. If not, he will not join and you will lose his 2 strength that could have seriously aided you in your attempt as the Texians to limit the final score for the forces of General Santa Anna. After the final Last Stand phase, the Mexicans pour through the walls like a leaky sieve and overwhelm the remaining defenders. In a gesture to their brave sacrifice, the Texian player is urged to yell out “Remember the Alamo!”, which adds a nice thematic ending to the game. The Mexican player has to breach the walls in 3 turns…and it really isn’t that easy to do. The design uses a diceless combat system that is all about having higher combat strength than the enemy at the right place, which I really like as it keeps the game simple and eliminates the need for crunchy CRTs and odds calculations common in heavier wargames. The sooner the walls are breached the better for the Mexicans as they have stronger forces to overwhelm the defenders. The longer it takes to breach, the greater chance the Mexicans will end with a less emphatic victory scoring fewer VPs, which is considered a victory for the Texians. The Alamo Remembered is a wargame filler. Not really deep, not overly complex but simply a thematic game that evokes the desperate nature of the Texians defense against superior numbers of Mexican troops. The game is almost romantic and causes a great deal of reflection by those who are playing it, which is the hallmark sign of a well put together thematic game. If a game about pushing cardboard can cause me to feel pride for our country and the pain and desperation of the men in that situation, bravo to the designer for a job well done. The mechanics work very well and the game offers very challenging decisions for both players. Do I place more men to defend here? Do I try to overwhelm the 3 breach value wall? Or is the Texian player going to anticipate that and place their 18 pounder cannon there to decimate my forces? The components are fantastic and the artwork on the counters and map are very nice and drip theme. In the end, the way that I typically judge whether a game is good or not is how I feel about playing it again. At our first sitting, we played the game three times back to back if that tells you anything. Solo is also very good and offers some different feeling mechanics as well. The game has kept me coming back for more and is definitely great fun that can be played in less than 30 minutes. A wargame filler is the best way that I can describe The Alamo Remembered, and keep in mind that I like fillers. Buy this game if you like a fast playing thematic experience that can be used as an introduction into the wargame genre or if you just like to have your heart strings tugged at in remembrance of a great historical event. To check out the components, take a gander at our unboxing video and to see our initial thoughts after our first play check out our Video Review. You can also get some insight into the rules as we look at various aspects of gameplay in our Action Point entries: Action Point 1 and Action Point 2. The Mexicans breach the walls at the highest valued section and the Last Stand phase is now initiated. Remember the Alamo!